When I moved to still rural Gloucester County, Virginia in May 1976, I didn’t know that I would soon be neighbors with dozens of men who landed on Omaha Beach in June 1944. They then were farmers, shipyard workers, mechanics, handymen, a general store owner/postmaster. More than 30 years earlier, they were infantrymen, artillerymen, tankers and quartermasters. All had been members of the 29th Infantry Division, a unit made up of National Guardsmen primarily from Maryland and Virginia. They came Monday through Saturday – usually in the mid to late afternoon — to the general store on Route 198 to pick up mail, some groceries, chewing tobacco, cigarettes and to swap gossip, not war stories. I was surprised and awed. Sproul couldn’t have been more gracious. He invited me to his home near the Cowpasture River in the Shenandoah Valley to meet with dozens of men he had served with in the Normandy invasion. Again, I was surprised and awed – now in interviewing these men for an anniversary story. Ten years later my boss at the Association of the United States Army, General Gordon Sullivan, and AUSA’s vice president for finance, Lieutenant General Tom Rhame, put me in contact with the Society of the 1st Infantry Division to line up interviews for a series of stories on the 60th anniversary. Over the course of several months, I interviewed at least a dozen veterans from the division. Several had been with the division in North Africa and Sicily and survived. One, who had an older brother lie about his age to enlist, turned 17 as he boarded a transport to cross the channel and met his fellow infantrymen for the first time. No longer surprised but still awed. Lillian and I arrived April 14 on Omaha Beach with a river cruise tour group on a spectacularly clear, sunny, warm afternoon. 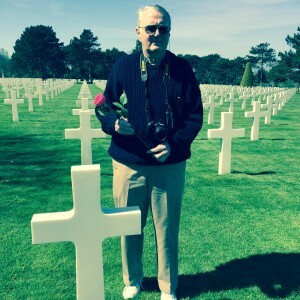 We gathered first at the Memorial at the American Cemetery at Colleville-sur-Mer, which sits on a bluff overlooking the channel. A French curator thanked us American for sacrificing so much to liberate her country from the Nazis. Many in our group cried as the National Anthem was played, and we tried singing along. Voices lost on a soft breeze off the water. I choked up with the playing of Taps for the 9,367 Americans buried here and the more than 1,100 missing in action. We had one World War II veteran in our group. Perhaps 30 of us were veterans of other times and were asked to step forward. I was handed a flower and so was Lillian. When the ceremony ended, I asked the curator where were most of the graves of the soldiers from the 1st and 29th. She said most were buried behind the chapel. I put the first flower on the grave of a soldier from the 115th [a member of the Blue part of the Blue-Gray division from Maryland and Virginia] who died on June 6, 1944. Nearby was the grave of another young man who died the same day as a soldier in the 16th Infantry [whose regimental heritage traces back to at least Gettysburg] of the 1st ID. I don’t know how they died. I don’t know exactly where they died. I don’t know if their remains had been moved from temporary graves. I only know they are in this cemetery now. We re-boarded the bus and drove slowly along the beach road to a stop near the National Guard Memorial. The young French woman who was our guide told us about both sets of her grandparents’ experiences — when the Germans arrived in 1940, the occupation and the liberation in June 1944 — they hid in a barn with other families fearful for their lives. She too thanked the Americans, the British and the Canadians for risking their lives to free France and Europe of the Nazis. There, at low tide, Lillian and I walked onto the beach. I emptied the little bit of water that remained in a plastic bottle and then scooped it twice into the loose sand to take home with us. As we walked back toward the bus, I looked up at the bluffs. They seemed far away and far higher than I imagined. I can’t imagine what Arch Sproul or that teen-ager with the Big Red One were thinking – other than how to stay alive and get off that beach. The sand we took that day is now in a pewter Jefferson cup on our mantle.